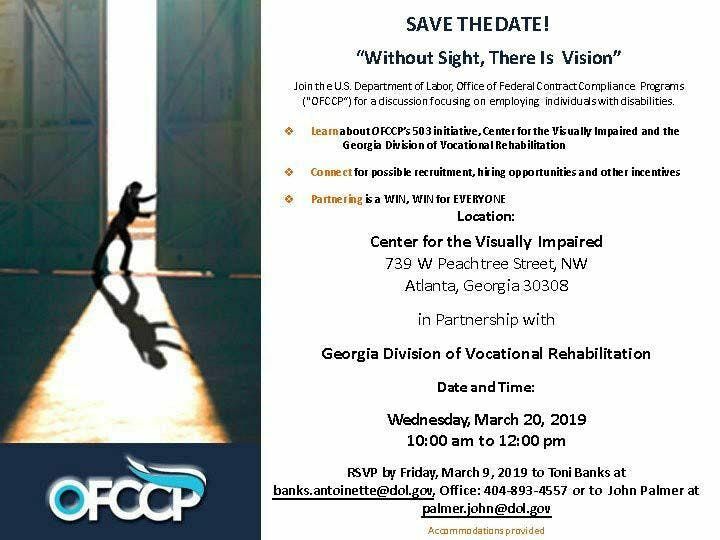 Join the U.S. Department of Labor, Office of Federal Contract Compliance Programs (OFCCP) in Partnership with Georgia Division of Vocational Rehabilitation for a discussion focusing on employing individuals with disabilities. 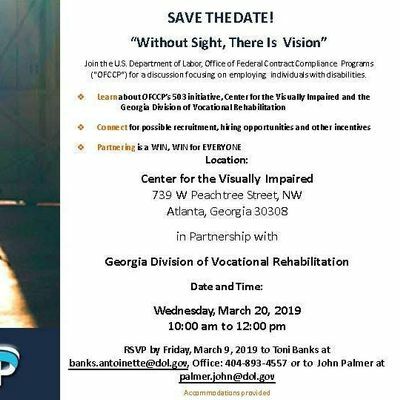 Learn about OFCCP’s 503 initiative, Center for the Visually Impaired and the Georgia Division of Vocational Rehabilitation. Connect for possible recruitment, hiring opportunities and other incentives. Partnering is a win-win for EVERYONE. RSVP by Friday, March 8, 2019 to Toni Banks at YmFua3MgISBhbnRvaW5ldHRlIHwgZG9sICEgZ292, Office: 404-893-4557 or to John Palmer at cGFsbWVyICEgam9obiB8IGRvbCAhIGdvdg==.